Seed silos have a variety of uses for grain, grain mixes, pellets and seed. GE Silos is an Australian family-run supplier of high quality silos to farmers for their feed storage needs. GE Silos has been supplying a wide range of silos for over 33 years including grain silos, pellet silos, feed and seed silos, elevated silos, superphosphate silos and field bins among others. Silos and silo accessories from GE Silos help farmers resolve four of their most common problems with feed storage. Duct tape is a very short-term solution for fixing a blown blower pipe on a silo. GE Silos offers a more permanent solution with their new blower pipe kits featuring 4.5mm pipe bends and 2mm straight pipe. Constantly blocked and leaking silos are very expensive problems, not only leading to wasted feed and labour trying to free blockages but also running the risk of the herd getting sick from mouldy feed. Fixing small holes and leaks with silicon and patches is a short-term solution. A new silo from GE Silos is a long term solution that will keep the feed in perfect condition. While small silos may mean a lower investment, the limited storage translates into less time between getting low on feed and running out completely. Besides, small loads of feed are much higher priced than larger loads. Feed silos from GE Silos will help the farmer save on bulk loads and never run out of feed again. Surface rust is generally not a problem if it is treated and re-painted. But rust can become serious when it eats into the legs, cones and walls of a silo as it can bring the whole silo down, creating a potentially dangerous situation. 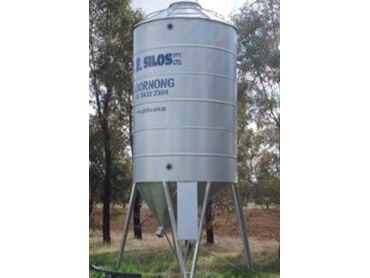 GE silos are made using high quality Australian made products and are manufactured to last.